I try to practice every day but it’s not always possible (especially if you had five glasses of pinot grigio the night before). It can be even harder when you’re traveling and you’re meeting up with friends, stuffing your face with local cuisines and enjoying a few mojitos. If you’re anything like me, you enjoy teacher-led classes and trying out new yoga studios and teaching styles, and are too lazy to pack your own yoga mat. Here are some tips from my own personal experience of finding places to practice Yoga, even if you’re only visiting a country for a few days. 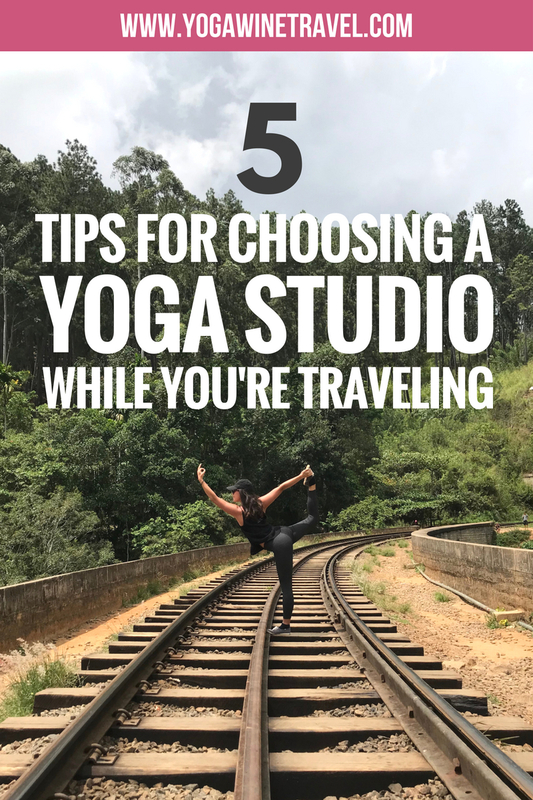 This may seem obvious, but before you jet off to your destination, ask friends, family and yoga teachers at your regular yoga studio if they have recommendations of where to go. Before I went to London, I asked around and found out about Indaba Yoga and ended up going there almost every day during my week-long trip. 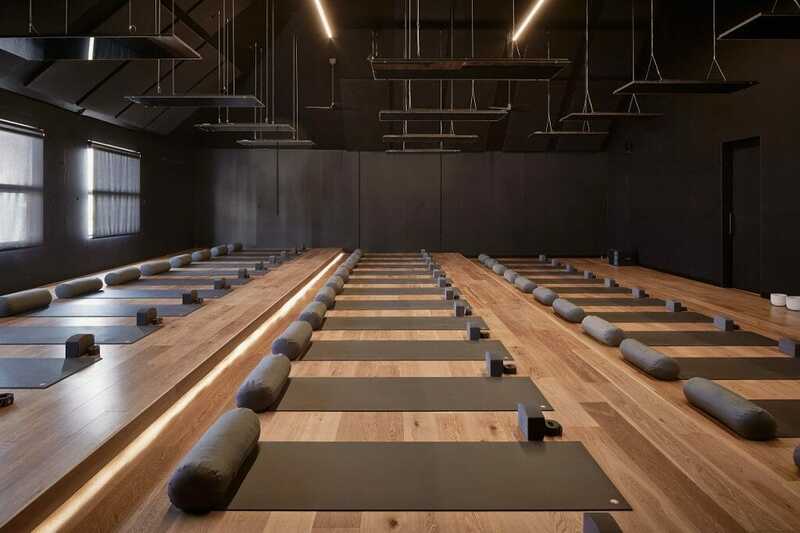 Read reviews on Google, Yelp (mostly helpful if you’re visiting the U.S.), Facebook and download the MindBody Connect app, which most yoga studios around the world use for scheduling and class sign-ups. If you end up booking a class through the app don’t forget to leave a review afterwards for future traveling yogis also! Most studios offer discounted introductory rates for new students, either for a set number of classes (e.g. 3 visits for $45) or for a set period of time (e.g. $99 for the first month). These deals are steals and well worth it. 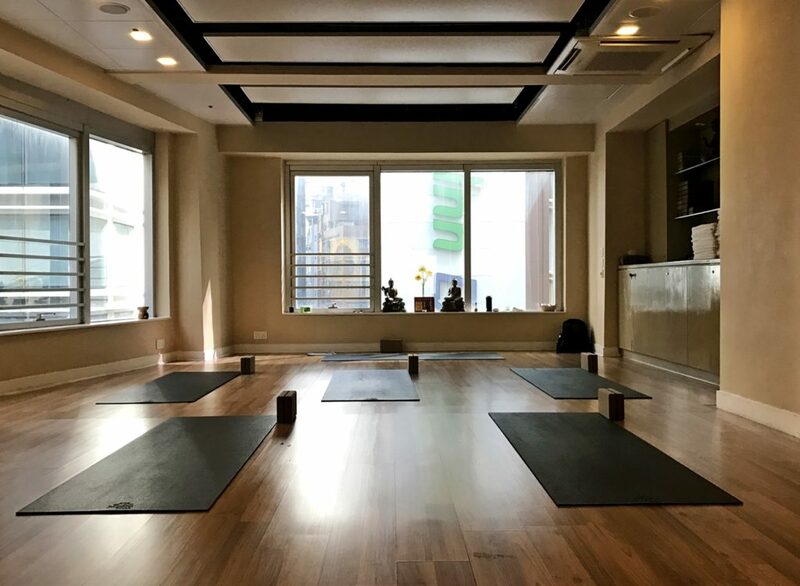 Some studios like Satori Yoga in San Francisco have community classes at a lower price point during non-peak times (early morning or later in the evenings) – these may work well with your travel schedule if you’ve got a packed day. Where are you staying? Where will you be spending the majority of your time? All things to bear in mind – you don’t want to be traveling 30 minutes to the studio. 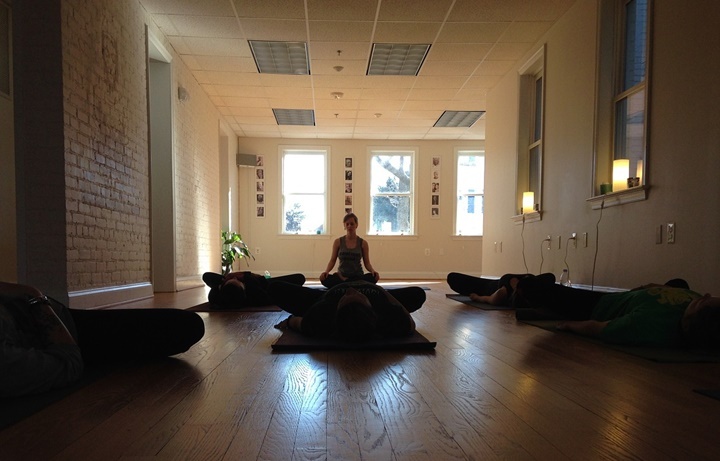 If you have plans before/after your yoga class, can you visit a studio close by? When I was visiting a friend in Melbourne, I chose not to visit the studio close to her home, but instead opted for a studio in the city close to her work – so I could meet her for lunch straight after. Use Citymapper or Google Maps to find out how to get to the yoga studio, how to get to your next destination, and how much travel time you should set aside. Do you normally practice vinyasa at home? Or ashtanga? Or are you a yin fan? Look at the studio’s class schedule online or via the MindBody Connect app and make sure the style you want is offered. There’s nothing worse, and I mean nothing worse, than walking into a class you thought was hatha and it turning out to be hot power vinyasa instead. If you’re not sure, this is a good explainer of the different styles of yoga. Be sure to introduce yourself and let the teacher know if you have any injuries. Want to know which Yoga apps every traveler should have on their phone? Read my article on 6 Yoga Apps Every Traveler Should Download Now! 5. Does the studio have the amenities you need? I’m not one of those people who “glow” after exercising, so if you’re anything like me then access to a fully functional shower and changing room is glorious and saves you a trip home. Find out if the studio has lockers, showers, towels (some places will charge a dollar or so), shampoo/conditioner, blow dryers and so on. Some places even offer GHD hair straighteners: fancy. These are just a few things I look for when I’m traveling to a new place and don’t want to miss out on stepping on a mat. If you don’t make it to a yoga studio, don’t fret! Remember that yoga is more than asanas (poses) and there are a plethora of ways to incorporate yoga into your life, even when you’re on the road! 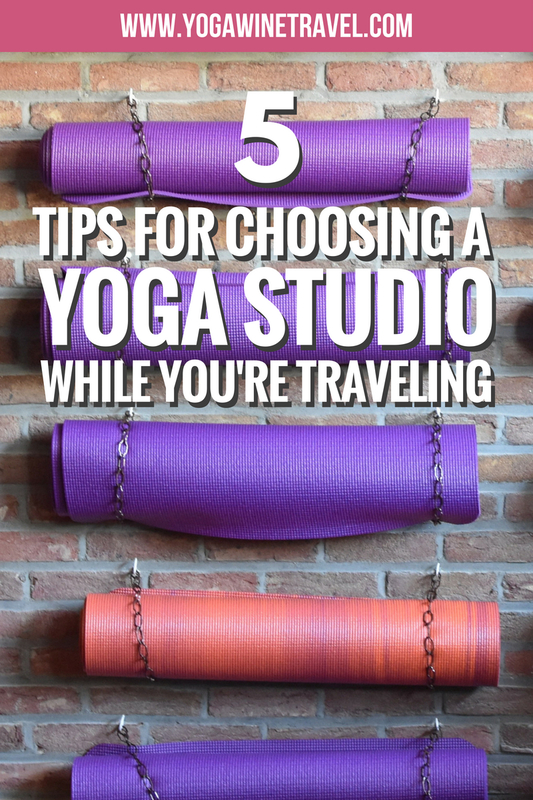 Have other tips for how to choose a yoga studio while you’re traveling? Leave a comment below! 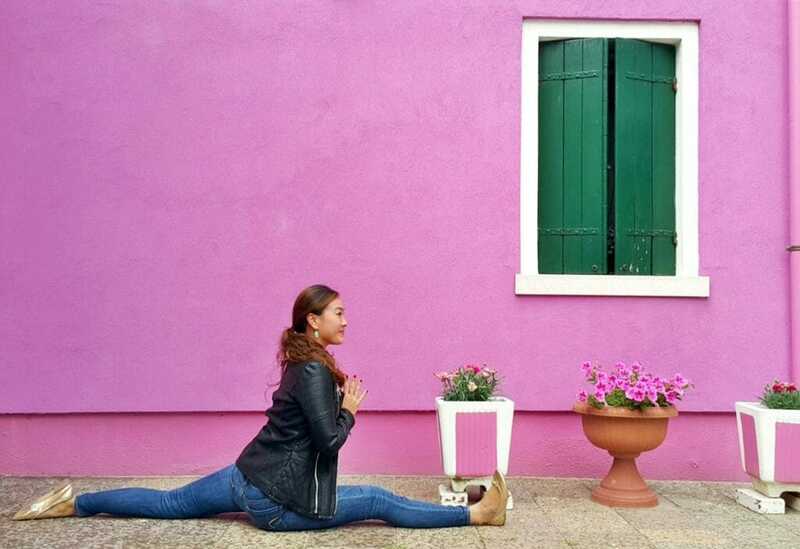 Check out the Yoga Studios Around the World series for some ideas of places to practice during your travels! Gata love Yoga!! There a so many great studios it’s always dificult to choose the right one! I always end up doing it by myself with videos lols. Always been intrigued by yoga and especially the resorts and places dedicated to it. Great tips for if I ever take the plunge and do it myself! Definitely stop by a studio or download an app and give it a shot Stephanie! Yoga is more than just touching your toes 🙂 If you’re interested you can look into the 8 limbs of Yoga! Fantastic, to each their own! I don’t practise yoga but I do go to the gym or run and I have the same reasons you mention for not going whilst traveling. Drinking too much the night before or eating too much or just being busy with touristy things! I could apply your ideas to finding a gym (which is likely where they have yoga anyway) in the location I’m going to be and see if I can find any offers. I think you may have found me at least 1 workout on my next trip! The Mindbody app lists gyms as well! Hope you find yourself a great class! I have not tried searching for a yoga studio when I am traveling. This is a good idea because I would meet new friends and experience doing yoga in a different country. I am also eager to stay fit and healthy when I travel. I agree that you need to consider the class schedules of a yoga studio. It would make sense that you would want to find somewhere that is able to provide a studio that works with your schedule. I’m looking for a new yoga studio so I’ll have to find one that has a schedule that works for me. I stick to the trails for exercising, especially while traveling. But yoga seems like a good local thing to do! 🙂 Any tips for looking abroad? Yup – all the tips in this post! 🙂 And the biggest one of all: remember that yoga is more than working up a sweat and “doing” poses on a mat. Let me know if you have any questions! 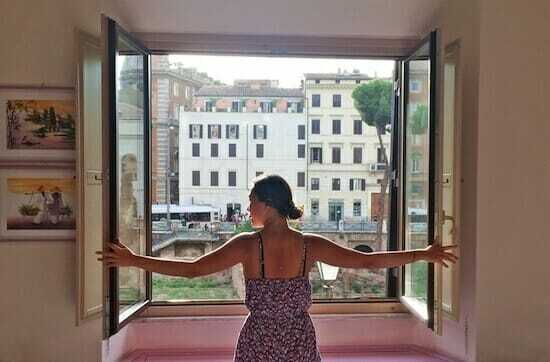 It’s really great tips for finding a place for yoga while traveling. When traveling I am changing places quite often and it seems an obstacle to me doing something like this. How long do you usually stay in one place when traveling? It depends! Most of the time not more than a few days, but it’s also possible to keep up a home asana practice. I agree that you need to find a yoga studio that has proper amenities. It would make sense to find one that has a shower if you need that after a workout. My sister is looking for a new yoga studio, so she’ll have to find one with the right amenities. 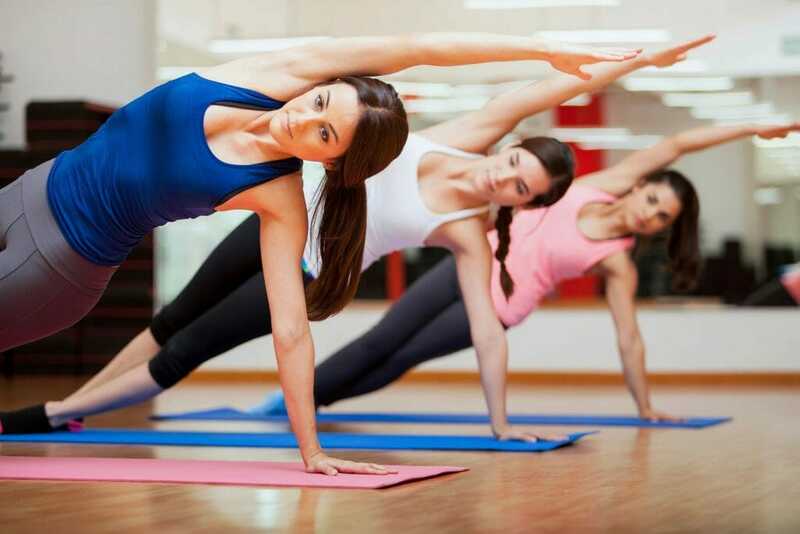 I agree that you want to find out about the schedule when you are choosing a yoga studio. It would make sense to find somewhere that fits into your schedule, especially if you are traveling. My sister is going on a month long vacation to visit our parents, so she’ll have to find a yoga studio over there that fits into her schedule. I love doing yoga every day to start off on the right foot. Next month I will be going on vacation with friends and am nervous about getting out of my morning yoga routine. I agree that location is important as well because I would hate to end up in an unsafe area, or even far away from the hotel where we are staying. I will be sure to look up the local yoga classes where we are going and check the reviews because I would love to try out new studios and find great instructors. I like how you say that you would want to consider the location of a yoga studio while traveling. It would be good to consider this because it would allow you to find one close to your hotel. I’m going out of town on business soon, so I’ll have to find a yoga studio close to the hotel to keep in practice. My husband and I are going travelling soon, and I definitely will need to find a yoga studio. I appreciate your advice that we should look for a studio with a shower. That would be helpful to keep on the go while we’re travelling.